An apparatus for recording and reproducing an information signal comprising a video signal and two channels of audio signals from an audio signal source in a plurality of successive tracks on a record medium (2), each track being divided into at least two sections, the apparatus comprising means (31, 39) for converting the two channels of audio signals into digital form and for compressing the digitized audio signal, recording means (40) for recording the compressed digitized audio signal in the successive tracks such that one field interval of the video signal is recorded in at least one of the sections of each track, and one field interval of the digitized audio signal is recorded in another section of each track, means (37) responsive to the output signal of the signal source for generating an identification signal representing the contents of the output of the audio signal source, recording means (40) for recording the identification signal, means for reproducing the video signal, digitized audio signal and the identification signal recorded on the record medium (2), means (41,44) for expanding the reproduced digitized audio signal, and for reconverting the expanded digitized audio signal to two channels of audio signal, and means (43, 46, 47, 48) responsive to the reproduced identification signal for generating output audio signals from the outputs of the reconverting means (41, 44). This invention relates to recording/reproducing apparatus. In a known helical scanning type video tape recorder (VTR), one end portion of each skew track is extended to record a time-base compressed coded sound signal in a time divisional manner with the video signal. In a one-rotation, two-head VTR of this type, even if the recording density is increased by decreasing the tape speed, the quality of reproduced sounds is not necessarily degraded. Furthermore, a two-channel sound signal (such as a stereo or a bilingual signal) can be recorded and reproduced. In addition to this, new sound signals can subsequently be recorded on a mgnetic tape which has already been recorded (hereinafter referred to as after-recording). A video signal recorded portion on the tracks corresponds to a half revolution (1800) of the reproducing rotary magnetic head. In order to obtain a recording portion of about 30°C for the coded sound signals by extending an end portion of the video track, the angle formed by the magnetic tape wound partially around the head drum is set to be about 210°. Therefore, while one of the magnetic heads scans the coded sound signals, the other simultaheously scans part of the video tracks. In this manner, a so-called overlap scanning is performed. Two-channel coded sound signals include a stereo broadcast signal, a bilingual broadcast signal and an input signal from a stereo microphone. The possibilities also include after-recording of the above-mentioned signals, two-channel (R and L channels) recording of a monaural signal, and L- or R-channel recording of the monaural signal. In general, the reproducing mode is exclusively determined. For example, a reproduced signal may be produced based on the assumption that first and second channels are defined as left (L) and right (R) channels, respectively. In another case it may be assumed that (L+R) and (L-R) signals are recorded in the first and second channels, respectively. After performing predetermined processing operations, the L and R signals are reproduced in the left and right channels respectively. In the latter case, a manual switch is provided to select the bilingual broadcast mode or one of the monaural and stereo modes. In a television receiver, a pilot signal is detected in a multiplex sound signal, thereby providing automatic switching. However, when the sound signal is recorded as a coded sound signal in a VTR, the pilot signal is lost. As a result, automatic switching cannot be performed. For example, assume that the recording/reproducing apparatus operates to record (L+R) and (L-R) signals using two channels, and the predetermined processing operations are performed to produce the L and R signals respectively. If then a tape on which the L and R signals from a stereo microphone have been recorded in the two channels is played back, unnatural sounds are produced. means responsive to the reproduced identification signal for generating output audio signals from the outputs of said reconverting means. Figure 7 is a partial plan view of the magnetic tape so as to explain its recording pattern with a cue track. Referring to Figure 1, a rotary drum 1 is rotated in a direction indicated by an arrow a. Rotary magnetic heads A and B are disposed on the rotary drum 1 at an angular interval α of about 180°. A magnetic tape 2 is wound around the rotary drum 1 from a point c to a point e so as to form an angle β of about 210°. The magnetic tape 2 is then guided by guide pins 3 and 4 and travels in a direction indicated by an arrow b. When the magnetic heads A and B are rotated through about 300 ( β- α) corresponding to the distance from the point c to a point d, pulse code modulated (PCM) and compressed sound signals are alternately recorded by the magnetic heads A and B. When the magnetic heads A and B are rotated through about 180° corresponding to the distance from the point d to the point e, they alternately record video signals Sv corresponding to one field. As shown in Figure 2, a track TA recorded by the magnetic head A and a track TB recorded by the magnetic head B are alternately formed on the magnetic tape 2. Points c to e of the track TA correspond respectively to the points c to e shown in Figure 1. An interval corresponding to the distance between the points c and d is a PCM sound signal recording portion Sp, whereas an interval corresponding to the distance between the points d and e is a one-field video signal recording portion SV. The track TB has the same pattern as that of the track TA. The magnetic heads A and B scan the magnetic tape 2 in the direction indicated by the arrow a, whereas the magnetic tape 2 travels in the direction indicated by the arrow b. The first embodiment in which a multiplex sound signal obtained from a tuner is to be recorded will be explained with reference to Figures 3 and 4. Figure 3 shows a frequency characteristic of the multiplex sound signal. A sound signal of a main channel is in a low frequency band, and a carrier signal of 2 fH, frequency modulated with a sound signal of a sub-channel is in a higher frequency band than that of the main channel. Moreover, a pilot signal representing the characteristics of the multiplex sound signal is located at 3.5 fH. When the multiplex sound signal is a stereo signal, a pilot carrier of 3.5 fH is amplitude modulated by a single tone signal of 982.5 Hz and when the multiplex sound signal is a bilingual signal, the pilot carrier is amplitude modulated by a single tone signal of 922.5 Hz. When the multiplex sound signal is a stereo signal, the sound signal of the main channel is L+R and that of the sub-channel is L-R. When the multiplex sound signal is a bilingual signal, the sound signal of the main channel is, for example, Japanese, and that of the sub-channel is, for example, English. If the input signal is a monaural signal, it only has a sound signal of the main channel. The first embodiment in which the above multiplex sound signal is used will be explained with reference to Figure 4. The multiplex sound signal supplied to an input terminal 20 is supplied to a low-pass filter 21 and a sound signal of the main channel is separated from the multiplex sound signal. The signal is supplied to a band-pass filter 22, the centre frequency of which is 2 fH, and the frequency modulated signal of the sub-channel is separated by the band-pass filter 22. The pilot signal is separated by a band-pass filter 23, the centre frequency of which is 3.5 fH, and the output of the band-pass 23 filter is amplitude modulation (AM) detected by an AM detector 25. The output of the AM detector 25 is the single tone signal of 982.5 Hz if the input signal is a stereo signal and is the single tone signal of 922.5 Hz if the input signal is a bilingual signal. Of course, if the input signal is a monaural signal, no signal can be obtained from the AM detector 25. The output signal of the AM detector 25 is supplied to band-pass filters 27 and 28 with a very narrow band. For example, reed filters can be utilized. The centre frequency of the band-pass filter 27 is 922.5 Hz and that of the band-pass filter 28 is 982.5 Hz. The outputs of the band-pass filters 27 and 28 are detected by detectors 29 and 30 respectively. Therefore, if the input signal is a bilingual signal, the output of the detector 29 is high, and if the input signal is a stereo signal, the output of the detector 30 is high. If the input signal is a monaural signal, the outputs of both the detectors 29 and 30 are low. These outputs of the detectors 29 and 30 are supplied to a logical circuit formed by NOR gates 32, inverters 33 and 35, and AND gates 34 and 36. The output signals of the logic circuit are supplied to a code generator 37 for generating a code signal representing the characteristic of the input signal. For example; "00" for monaural, "01" for stereo and "10" for bilingual may be assigned. The output signals of the low-pass filter 21 and a frequency modulated (FM) demodulator 24 are supplied to an analog-to-digital (A/D) converter 31 through a switch 26 for selecting the output of the low-pass filter 21 or of the FM demodulator 24 as an input of the A/D converter 31. In a monaural mode, the output of the low-pass filter 21 is supplied to both first and second input terminals of the A/D converter 31. In a stereo mode, signals of L+R and L-R are recorded. These signals are converted to digital signals by the A/D converter 31. The code signal from the code generator 37 is added to the output of the A/D converter 31 by an adder 38. The output of the adder 38 is supplied to a PCM encoder 39 in which the output of the adder 38 is converted to a PCM signal, the parity signals for error correction are added to the PCM signal and the signal is interleaved for protection from drop-out. The output of the PCM encoder 39 is supplied to a recording head 40. As is clear from the above explanation, the code signal representing the characteristic of the input sound signal is handled as a part of the data signal, so even if drop-out exists, the error caused by the drop-out in the code signal can be corrected by the error correction circuit in the reproducing circuit. The reproduced signal from a reproducing head 40 is supplied to a PCM decoder 41 in which the reproduced signal is de-interleaved and error correction is performed by a well known method. The decoded signal is supplied to a code separation circuit 42 in which the code signal is separated from the remaining data. The separated code is supplied to a code detector 43 for generating the respective mode signals. The output of the code separation circuit 42 is supplied to a digital to-analog (D/A) converter 44 in which two channel signals are generated. The outputs of the D/A converter 44 are supplied to output terminals 49 and 50 through a mode selection circuit, and the proper mode signals selected by the code signal are obtained at the output terminals 49 and 50. If the recorded signal is a stereo signal, movable taps 46c and 46c' of a selecting switch 46 are connected to fixed taps 46a and 46a' respectively by a stereo mode signal from the code detector 43, and so output signals L and R of a matrix circuit 45 are selected. The outputs of the switch 46 are then supplied to the output terminals 49 and 50 through a switch 48. If the recorded signal is a bilingual signal, the outputs of the D/A converter 44 are supplied to a manually operable switch 47 through the switch 46. The switch 47 selects one of the signals of main and sub-channels, that is, if movable taps 47c and 47c' are connected to fixed taps 47a and 47a' respectively, the signal of the main channel is supplied to both output terminals 49 and 50, and if the movable taps 47c and 47c' are connected to fixed taps 47b and 47b' respectively, the signal of the sub-channel is supplied to both output terminals 49 and 50. In this bilingual mode, movable taps 48c and 48c' of the switch 48 are connected to fixed taps 48a and 48a' respectively, and the switch 48 selects the outputs of the manual switch 47. In a monaural mode, the outputs of the D/A converter 44 are supplied to the output terminals 49 and 50 through the switches 46 and 48. As is clear from the above explanation, the mode selection can be performed automatically by utilizing the code signal recorded together with the data signal. Figure 5 is a block diagram of the second embodiment which is a sound signal recording and reproducing apparatus wherein after-recording and other forms of audio signals such as the output of a microphone are considered. In the recording mode, the sound signal is supplied to a block 61 which comprises an A/D converter and a channel change-over circuit. The sound signal is processed for first and second channel selection and is A/D converted. The digital sound signal is then supplied to a block 62 which comprises a PCM modulator, a marker generator and an FM modulator. In the block 62, an error correction sign is added to the digital sound signal and a marker (or a data sync and an address) is added to the beginning of each data block, thereby forming a time-base compressed PCM signal which has a predetermined format. In the block 62, this PCM signal is converted to a non-return-to-zero (NRZ) code system and is then FM modulated. The FM-modulated signal is then supplied to a rotary recording head 40. Figure 6 shows a recording format of a PCM sound signal recording portion Sp of each track shown in Figure 2. In two-channel recording, the data blocks of the first and second channels are respectively sandwiched between the markers and are recorded in every other data area. Table 1 shows the recording input and the reproduced output which correspond to the type of sound signal to be recorded. The mode Al in Table 1 indicates that a bilingual signal is received as a recording input. For example, Japanese is recorded on the first channel (CHl), whereas English is recorded on the second channel (CH2). In the mode A2, a stereo signal is received; the R+L signal is recorded on the first channel and the L-R signal (or R-L signal) is recorded on the second channel. After-recording of the stereo signal in the stereo mode (using the first and second channels) can be performed in the same manner as described above. In the mode A3, a stereo microphone output is supplied as a recording input. The R signal is recorded on the first channel, and the L signal is recorded on the second channel. After-recording of the stereo microphone output can be recorded in the same manner as described above. The mode A4 in Table 1 shows a case in which a monaural broadcasting signal is received as a recording input or a monaural microphone output is received as the recording input. In this case, the monaural sound signal is recorded on the first channel, whereas no signal is recorded on the second channel. After-recording of the monaural signal on one of the channels (as well as two-channel monaural after-recording) can be performed in the same manner as described above. In this case, the signal recorded on the first channel is erased. In the mode A5, one-channel after-recording is performed. The monaural broadcasting signal or the monaural microphone output is recorded on a free channel. The previous monaural signal is left unerased. In the recording mode, identification (ID) signals which respectively correspond to modes Al to A5 are recorded together with the PCM sound signals. As shown in Figure 5, in the case of recording the broadcasting signal, a mode signal M1 is supplied to a block 60 which comprises an ID change-over signal generator and a channel change-over signal generator. The mode signal Ml indicates one of the monaural (A4), stereo (A2) and bilingual (Al) modes. In the case of recording a microphone output or an external input, a mode signal M2 is supplied to the block 60 so as to indicate that the input signal corresponds to one of the stereo (A3), monaural (A4) and one-channel after-recording (A5) modes. The mode signal M2 is generated by a control section of the VTR. The block 60 generates an ID change-over signal S1 corresponding to one of the modes Al to A5 in accordance with the mode signal M1 or M2. Furthermore, the block 60 generates a channel change-over signal S2. The signal S2 is supplied to the block 61, whereas the signal S1 is supplied to the block 62. In the block 62, part or all of the contents of the marker shown in Figure 6 is changed in accordance with the signal Sl. An updated marker is recorder as an identification signal. For example, a code "11110000" is recorded as a marker in the mode A1. A code "11110011" is recorded as a marker in the mode A2. The reproduction mode is determined in accordance with the reproduction signal of the marker. Another recording method is provided to record the ID data signal as follows. An ID bit is assigned in the data block of the PCM sound recording signal. In this case, an ID code is formed in accordance with the ID change-over signal S1 to record the obtained ID code. Alternatively, as shown in Figure 7, a cue track TQ is formed in the tape pattern, thereby recording the ID data signal by the stationary head. It is preferred that the ID data signal is recorded for every track (or field) so as to allow random reproduction. Referring again to Figure 5, in the reproduction mode, the reproduced PCM sound signal from the rotary reproducing head 40 is supplied to a block 65 which comprises an FM demodulator, a decoder, and a marker detector, and to a block 64 which comprises a D/A converter and a channel change-over circuit. The sound signal is properly processed and is produced as an audio signal. In the block 65, a marker signal S3 detected by the marker detector is supplied to a block 66 which comprises an identification circuit and a channel change-over signal generator. The mode of the recorded sound signal is discriminated so as to correspond to one of the modes Al to A5. Furthermore, a channel change-over signal S4 for selecting the channel L or R is produced. The channel selection signal S4 is supplied to the block 64. For example, the channel selection operation is performed like the reproduced output shown in Table 1. 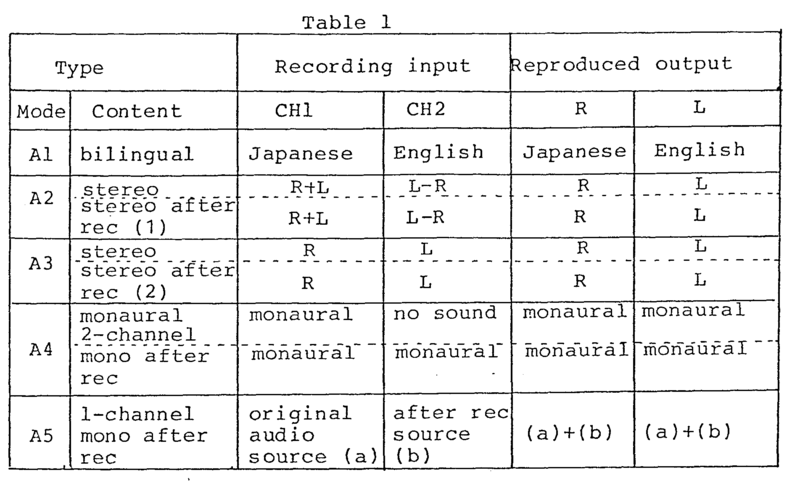 In the case with reference to Table 1, Japanese is produced from the right and left channels R and L in the mode A1. It is noted that the English output can be obtained by the operation of the manual channel selection switch. A matrix operation is performed to produce the R and L signals respectively from the right and left channels R and L in the mode A2. The reproduced sound signals of the first and second channels are respectively produced at the right and left channels R and L in the recording mode A3. The monaural signals are produced at the right and left channels R and L in the recording mode A4. The original sound (a) of the first channel and the after-recorded sound (b) of the second channel are added to produce an (a)+(b) monaural sound signal which appears at the right and left channels R and L in the recording mode A5. In the manual mode selection mode, as shown in Figure 5, a mode signal is supplied to the block 60 of the recording system and to the block 66 of the reproducing system. Therefore, desired recording and reproducing modes are specified independently of each other. Furthermore, the recording mode can be automatically set and the reproducing mode can be manually set. Alternatively, the recording mode may be manually set, and the reproducting mode may be automatically set (that is, the channel selection is automatically performed). In the above embodiment, the modes Al to A5 are used. However, the modes A2 and A4 or the modes A3 and A4 need not be distinguished from each other. Furthermore, only one of the modes A2 and A3 may be utilized. Thus in the embodiments, an ID code is recorded to detect the contents of the coded sound sinal recorded in accordance with two-channel recording. In the reproducing mode, the output conditions at the two channels are then determined. A sound monitor output can be automatically obtained so as to correspond to various types of after-recording modes and multiplex sound signal recording. means (43, 46, 47, 48) responsive to the reproduced identification signal for generating output audio signals from the outputs of said reconverting means (44). 2. An apparatus according to claim 1 wherein said identification signal is added to the digitized audio signal and is recorded in the same section of each track as that where the digitized audio signal is recorded. 3. An apparatus according to claim 2 wherein said converting means (31, 39) includes a parity signal adder for adding the parity signal to the digitized audio signal for error correction when the digitized audio signal is reproduced. 4. An apparatus according to claim 1 wherein said second recording means (40) records said identification signal in an additional track by a fixed head. 5. An apparatus according to claim 1 wherein said second recording means (40) records said identification signal at least once every track. 6. An apparatus according to claim 1 wherein said converting means (31, 39) includes an analog-to-digital converting circuit (31) for converting said two channels of audio signals into digital form. AT83301591T AT38457T (en) 1982-03-25 1983-03-22 Apparatus for recording / playback.